Don’t be shocked, but that headline is false. Whoops, we should have given a spoiler alert for that. But since the post is by NewsHound Priscilla, that really wouldn’t be much of a spoiler. When somebody else says something that he feels is not accurate, he [O’Reilly] unleashes his patented fatwa, such as when he recently attacked a journalist for lying – an attack based on an O’Reilly lie! The movie version of “Killing Jesus” did get some negative reaction. You expect this type of thing on biased right wing media, but isn’t Bill O’Reilly supposed to be a legit “no spin” journalist? If you’re going to be “fair & balanced,” be accurate. So why does The Cable Gamer say the NewsHound headline (“O’Reilly used a bogus quote”) is false? Because it is. O’Reilly’s quote was 100% accurate. It’s Priscilla who is not being truthful. A correction! Why did Priscilla leave that out? Guess what appears at the bottom of the article? So the correction that Priscilla hid from her readers was Time changing “novel” to “book”—exactly the issue raised by O’Reilly. A correction that just happens to prove the NewsHounds post to be a worthless falsehood. Remember how Priscilla called Bill’s complaint “an O’Reilly lie?” It wasn’t. The only person who actually told “an O’Reilly lie” is Priscilla herself. But that’s to be expected from a NewsHounds writer with a record of flagrant fabrications about Fox News. Don’t hold your breath waiting for the apology to Bill O’Reilly. Why do you think Top Dog Ellen Brodsky keeps Priscilla around after years of brazen dishonesty? Certainly not to say she’s sorry for doing her job: lying about Fox News. 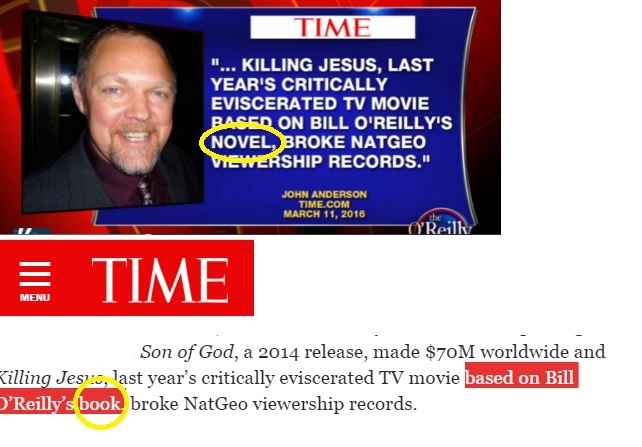 Do we know whether the NewsHounds article was posted before Time Magazine made the correction on March 16th? Given that the NH column is dated March 21st, I believe the answer is NH posted the column after the correction by Time. So for NH to claim, “A bigger problem is that O’Reilly changed Anderson’s quote” is clearly a black eye for NH and deserves a correction. A good catch by TCG. Although some might argue that whether it’s called a “book” or a “novel” is kind of a petty point for either NH or BOR to focus on. Was “critically eviscerated” biased hyperbole or were there examples to support this claim? Read the following and decide for yourself. TCG disagrees by stating, “In fact, it was nominated for a best-movie Emmy!” But haven’t many movies over the years received nominations even though they were panned by the critics? Eviscerated (literally “disemboweled”) is pretty dubious when most critics (57%) liked it. And I’m not sure a movie that truly was eviscerated by critics is likely to be nominated for the equivalent of a Best-Picture Oscar. Then again, basically repeating the same selectively chosen quotes cited by NewsHounds doesn’t really advance your argument. Their list is like the montages of coverage done by many sites to prove a predetermined point. One can easily do a montage showing the opposite (at least with Fox or CNN), just as one can easily do a list of quotes from critics that hasn’t been chosen to make the reviews look bad. Still I agree with the NewsHounds author that this is a secondary point, so I didn’t spend much time on it. And your point about O’Reilly being petty is a fair one. People are going to start thinking he’s got an ego or something.